By Aila M. Matanock and Natalia Garbiras Díaz. US Secretary of State John Kerry meets with Colombian officials in Havana, Cuba, to discuss peace negotiations with the FARC, March 21, 2016. 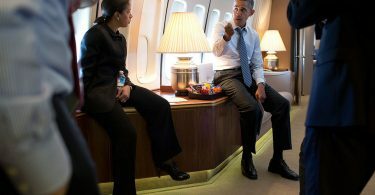 Photo via U.S. Department of State. Colombia has almost succeeded in ending a fifty-year civil conflict with leftist guerrillas. The government and the Revolutionary Armed Forces of Colombia (FARC) are finalizing a peace agreement, so far agreeing on important sets of proposals, including some that may be viewed as concessions to the guerrillas. And while excitement and anticipation are certainly due in light of the progress made to date, there is still cause for concern as the peace process enters its final stages. Our recent work suggests that opponents to the peace process may be able to tap into Colombian attitudes regarding the FARC – and potential concessions to the group – to convince citizens to vote “NO” in a critical upcoming plebiscite. Of concern are proposals which, for example, include political and electoral participation provisions such as the possibility that the FARC will become a political movement or party and that a number of seats in the Senate will be reserved for the FARC (while this proposal has been widely discussed in the country, it has not been officially included in the draft on political participation agreed in Havana). Our prior work suggests that such provisions may be conducive to peace by helping combatant leaders share power in a way that can be enforced by observers and donors—and, indeed, the UN will verify Colombia’s peace agreement—but they also may be unpopular with the population, potentially derailing a peace agreement. Not only would allowing the guerrilla groups to become political parties potentially alter aspects of the political and electoral system (although that could be popular as it potentially makes them more representative), voters may also be hesitant to confer legitimacy on a party formed by former rebels. These concerns are made central in this peace agreement by the approval mechanism and the politics around it. A recent milestone in the process was the announcement of detailed steps for the end of the conflict, including an agreed upon mechanism for approving the final settlement – a plebiscite put before Colombian voters. For the settlement to take effect, it must be approved by a majority of those voting, and at least 13% of the electoral census must turn out to vote. 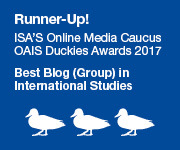 Such a vote seems to be an unusual move: plebiscites or referenda on particular components of peace agreements are sometimes seen in separatist conflicts but otherwise seem uncommon – and perhaps with good reason (for a cautionary tale, see Seligson’s work on Guatemala). It is clear that the plebiscite will face opposition. While last month the Constitutional Court cleared the way by declaring it constitutional, this month former President Alvaro Uribe officially declared he and his party will campaign for “NO” in the coming plebiscite. And it might work. Polls this summer haven shown both “YES” and “NO” leading, with close margins, but many remain indecisive or plan to abstain from voting (9.1 percent and 24.6 percent, respectively, according to the latest public opinion numbers). Dynamics that we detected suggest that the opposition may be able to swing these votes. Colombians are very supportive of the ongoing peace process (approval was 5.0 on a 1-7 scale), but – returning to our main point – they are less supportive of particular provisions that may be construed as concessions (support for the FARC forming a political party was 18.7 percent), and they deeply distrust the FARC (trust was 1.4 on a 1-7 scale) (based on the authors’ analysis of data from LAPOP 2015). To more rigorously assess these attitudes, our recent paper examines whether FARC endorsement of a particular policy proposal affects support for that part of the peace process. In an endorsement experiment in the 2015 AmericasBarometer survey in Colombia, which surveyed 1,390 individuals living in the municipalities most affected by conflict, we asked respondents to report their support for a proposal to provide more representation in the Lower House to the areas of the country most affected by conflict (an item included in the draft of the proposed peace agreement negotiated by the parties). 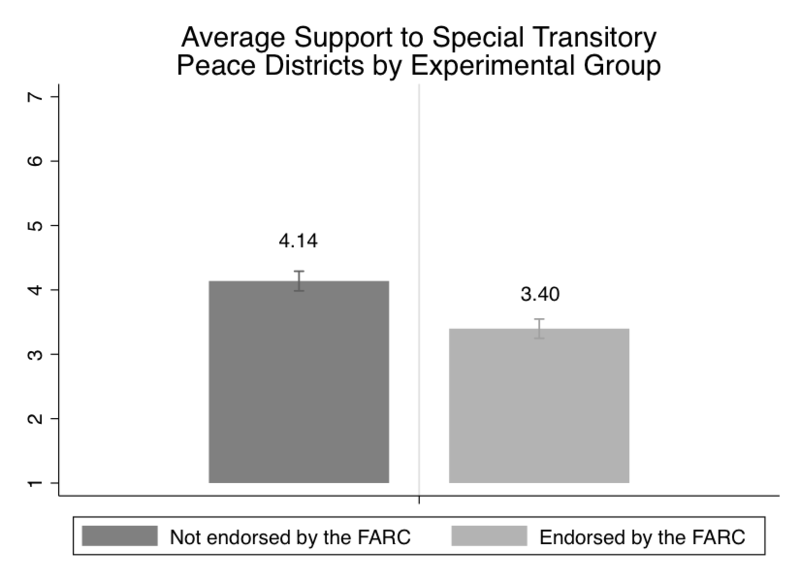 We found that when the proposal is associated with the FARC, and potentially seen as a concession for the group, support is dramatically lower than when it was simply seen as part of the peace process. An endorsement by the FARC results in an acute drop in the percentage of respondents supporting the proposal from 44.4 percent down to 31 percent. These results are even more surprising given that all respondents were sampled from the regions that would directly benefit from it. This suggests that strong negative attitudes toward the FARC, as well as distaste for potential provisions seen as concessions, could counter strong support in Colombia for the overall peace process. Ultimately, Colombia is a democracy and, as such, President Santos has been emphatic that Colombians will have the last word on the approval of the final peace agreement. Now that the Constitutional Court has ruled in favor of the plebiscite, it is set to move forward to the campaign period. Our results suggest that the opposition may be able to emphasize aspects of the peace agreement, including the potential electoral inclusion of the FARC, political changes, and anything that may be seen as concessions, to turn some of the many uncommitted Colombians away from the peace process and towards a “NO” vote. Critically, however, the design of the plebiscite may prove a smarter strategic decision by the government to get approval. Requiring only a single vote on the peace process from just 13 percent of the electoral census in Colombia may help finalize the agreement (to learn more on the next steps of the plebiscite, go here and here). In general, though, involving voters in the final stage of a peace process negotiated by leaders can be risky. The impulse in future peace processes, especially in democracies, may be to include a mechanism for voter legitimization. The Colombian case, however, suggests that rebel groups and the concessions provided for them – inherent parts of settlements – may be unpopular. In such instances, the inclusion of political and electoral provisions, in combination with plebiscites or referenda, may actually serve to derail the very peace processes they seek to substantiate. 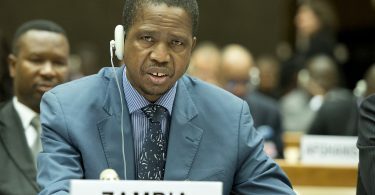 What’s Going On in Zambia?